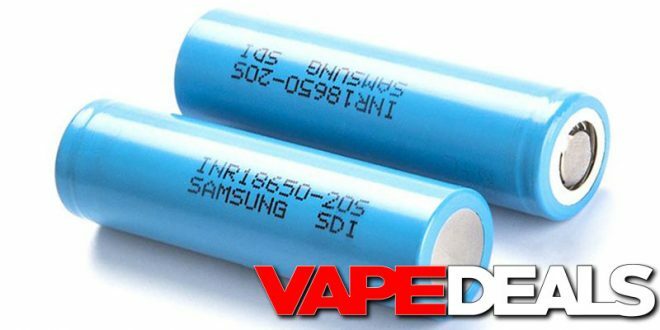 Lightning Vapes just sent out a notification that they have the Samsung 20S in stock. According to Mooch, these are the hardest hitting 18650 batteries on the market right now. Looks like a great option for the high-wattage users out there (30A/2000mAh). Prices start at $5.09 for a single battery, but you can save more if you buy more. For example, an 8-pack will only cost you $34 total ($4.25 each). Just be sure to apply coupon code “LV15” at checkout to get the reduced price. This is listed as a Non-Discountable Item, but the coupon code worked just fine for me (your results may vary). Also, keep in mind that you can get a 30mL of LV Max VG E-liquid for $1 if you spend $30 or more.